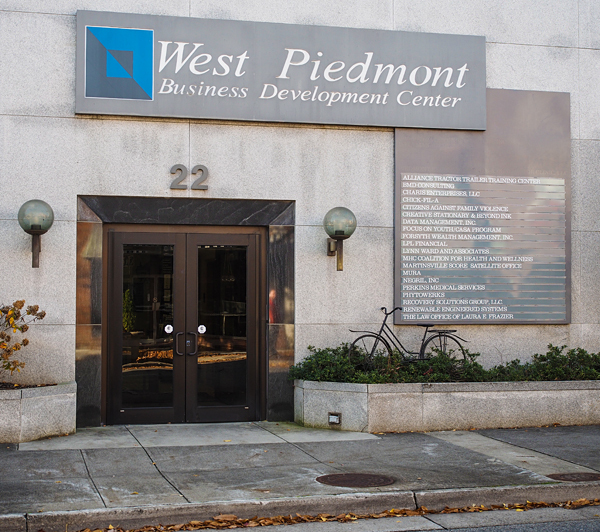 Serving the City of Martinsville and the Counties of Henry, Franklin and Patrick, Virginia, the mission of the West Piedmont Business Development Center is to attract, assist, educate and encourage emerging entrepreneurs by providing a favorable environment for their growth and development. Affordable office and light manufacturing space, shared office equipment and services make it possible for small businesses to reduce the many costs associated with establishing and operating a business. Tenants in the Center are provided an advisory team of financial, managerial and business planning professionals to support their businesses as they endeavor to develop, grow and succeed. The Center can house between 10 and 20 new businesses in the approximately 23,500 square feet of total building area. Flexible office suites range from as small as 100 square feet to as large as 2000 square feet. Light manufacturing or assembly spaces range from as small as 450 square feet to as large as 3000 square feet with common loading dock, shipping and receiving areas. As businesses grow and develop, the Center can adapt floor plans to the growing needs of its tenants. The Center offers state-of-the art high-speed fiber optic data connectivity to its tenants up to 100mbs. In addition to favorable rents, common reception area, conferencing and training facilities, the Center also offers support services on an as-needed basis including clerical assistance, copying, reproduction and facsimile services. The Center is conveniently located within walking distance of the financial district of the City of Martinsville, City Hall and the US Post Office. To date our incubator has helped to create 250 new jobs (and counting)!